In this fast paced life we live in now, relaxation is no longer a luxury, it is now a need. Spa, what comes into your mind when you hear the word? For me, I imagine scents of essential oils, nature kind of music and delicate hands going through my legs down to my feet. 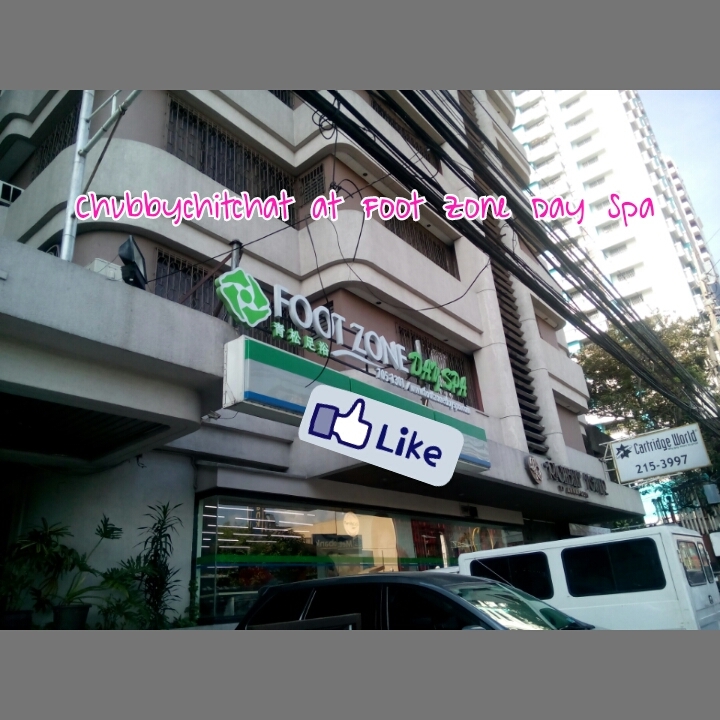 Yes I am a foot spa and massage addict, so when we got an invitation from Foot Zone in Annapolis Greenhills, we decided to give it a try plus I've been complaining about my sore feet hence the much needed foot massage. Upon entering the lobby, we were greeted with a hotel like set up and was offered hot salabat tea while waiting for our rooms to be ready. When we were given the go signal we were lead to a room wherein two massage chairs were available per room and the feels of yet again a hotel room where there is TV, slippers and own airconditioning system. We were asked to change into the provided clothes so we could be comfortable. 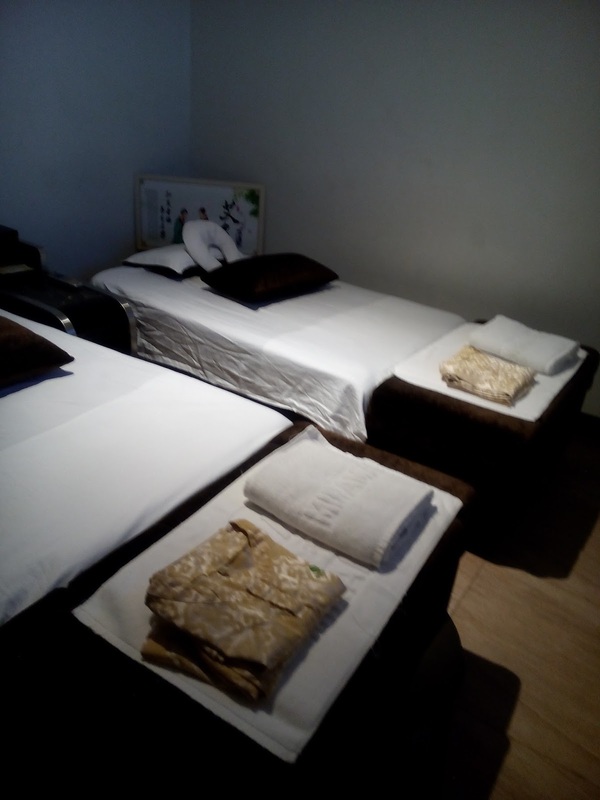 When the masaage therapist came in, we were asked if we want the lights dimmed and if we want to adjust the aircon plus offered if we want tea or water, that is good service for me. 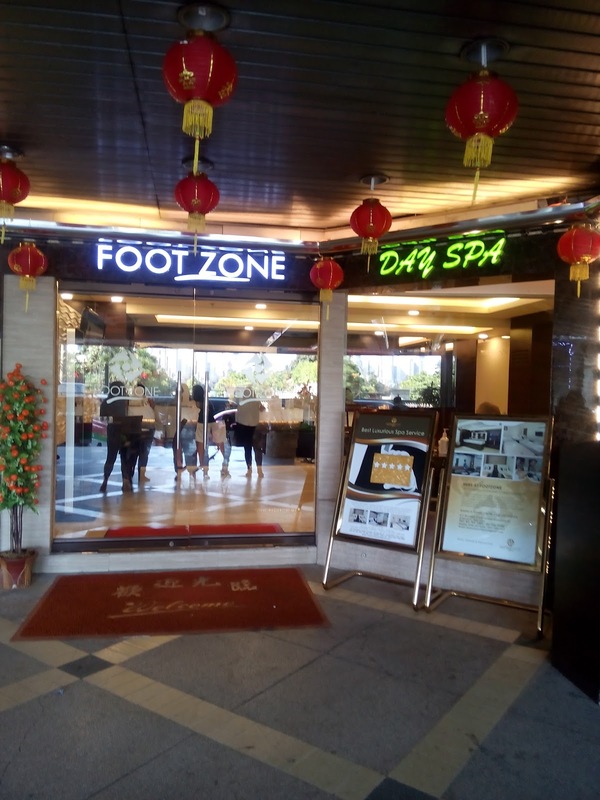 We were informed that we will be treated to a foot spa and a classic body massage, what a gread afternoon to hear those relaxing words lol! So the foot spa started with a bucket of warm water so our feet would be relaxed, the foot spa and massage was very relaxing to the point that I snoozed a bit. After the foot spa, the therapist informed us that the ones who will do our body massage will replace them. While waiting we were chatting with our friends from the other room since WiFi was available within the massage room premises. When the body massage started, I already don't know how to explain because all I felt was pure relaxation. So to summarize our afternoon, it was a superb experience we didn't even wanna go home yet and we were asking them jokingly if we could continue sleeping for another hour. 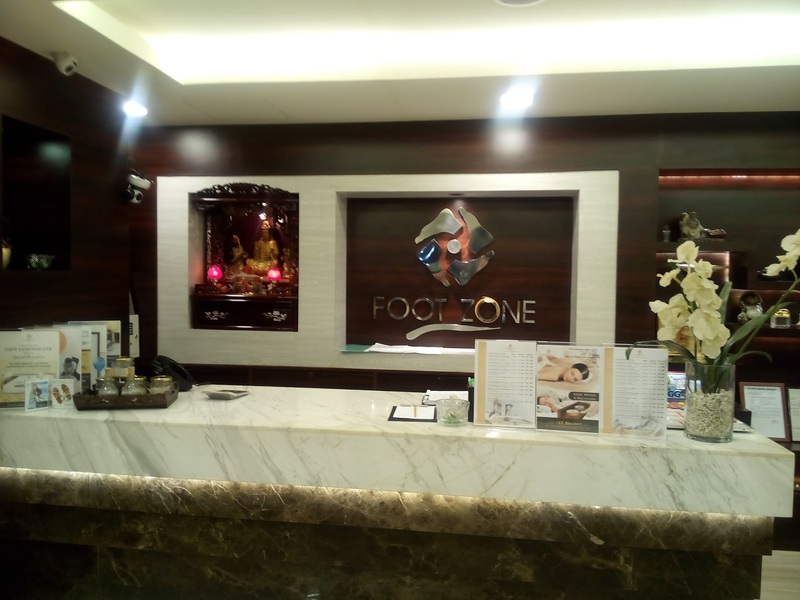 By its name Foot Zone, do not be deceived it is not true that they are just good for your feet, they were also excellent in the body massage. The next time I will come back, I will be bringing along the husband because I am sure he will love it too. Before the movie started Lee Kum Kee bosses revealed their main gift for the kids and the foundation. 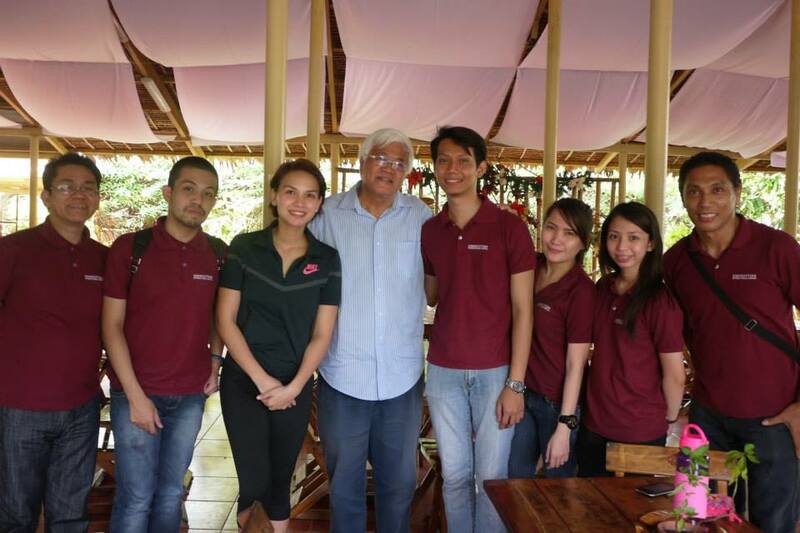 Lee Kum Kee donated Php 500,000 for the foundation as a gift and to help the children under their care. 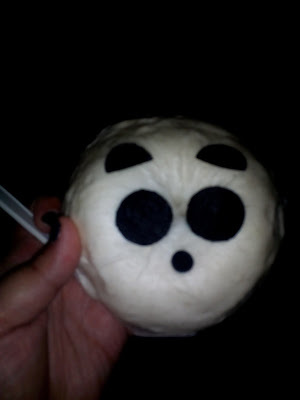 When the movie rolled, giggles were heard all over, and the kids were very fond of the story, and I am sure they enjoyed their day with this treat from Lee Kum Kee. Honestly I haven't tried using Lee Kum Kee in my cooking, but because they gave us Lee Kum Kee products, I was able to incorporate it in my home cooking and my whole family loved it. Thank you Lee Kum Kee! Senator Gregorio Honasan a name when mentioned would instantly create a throwback photo in my mind, him dressed in his soldier suit. History classes made him famous, pertaining to him as the man from the coup, so when I got an invite for a chitchat with him together with other fellow bloggers, I didn't think a bit and said yes, of course a once in a lifetime opportunity to get talk to one of our Senators and now running for a Vice President position in our government. Seeing Senator Honasan for the first time gave me that huge smile, he is indeed handsome as how my oldies would describe him, at first I thought there might be some guidelines on what kind of questions were allowed for the discussion. (filtering of questions are being done even in showbiz events lol!) But nah-ah, we were free to ask him anything we want, about his family, his views, politics etc. As a father, he is the calm one. He giddily tells us how his wife was more of a disciplinarian than him, that when he comes home earlier than his children, he'd actually wait for them and share a meal, stories or even jam with them until the wee hours of the morning. 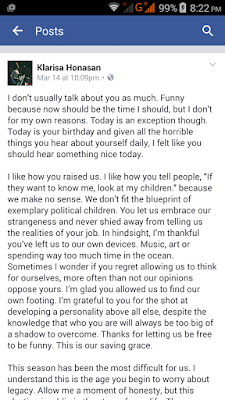 He also told us that his children are not at all affected by all the news and whatsoever people and media tell about him, maybe because they know him best than what they get to hear outside, and inside their home they are just like everyone else, a normal family. I had a hard time continuing my story about this Senator, maybe because during our chat he didn't talk too much politics, to the point that I felt he was a relative, an Uncle sharing stories of his life. 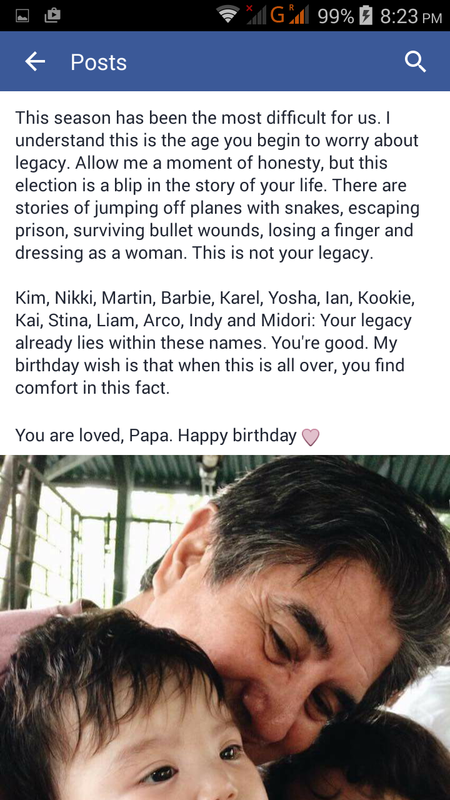 And then I saw on his official facebook page that it is his Birthday, I browsed through his wall greetings (stalker peg) and stumbled upon a greeting from his daughter, it was heart warming but not to the point of super drama, direct to the point but not tactless, and truth about the love she feels for her father. And then from there it struck me, maybe that is why I can't finish this article because I am focusing too much on the political side, of what he could do for our country or if he'll be the Vice President could he actually improve the security of our people because that was his priority when I asked him. 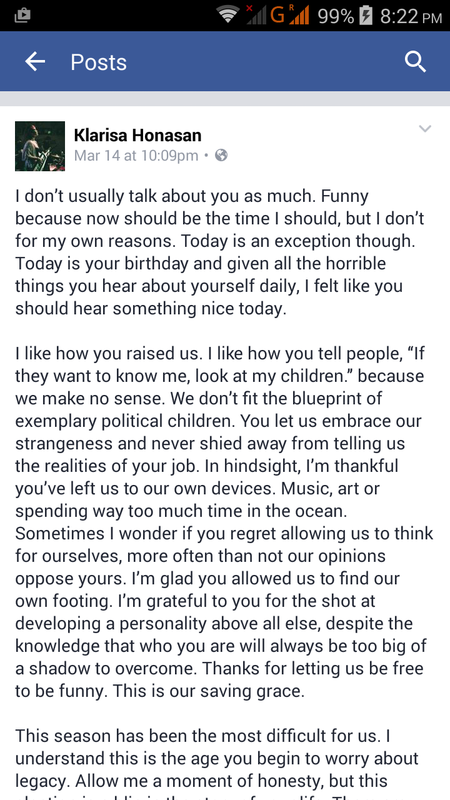 Nonetheless I am happy I saw that post of his daughter, it made me realize that sometimes it is better to look into a persons heart than his mind, that not all military men are just plain tough and strict they have a heart too. 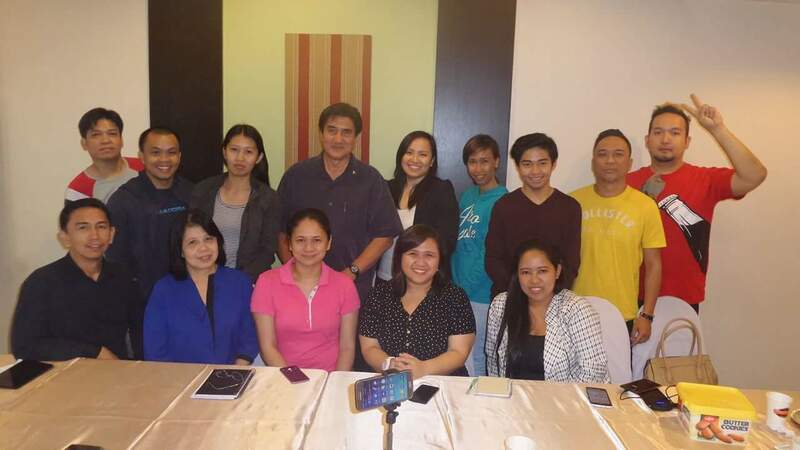 Yes, it was just my first time to have met VP candidate Gergorio Honasan but a man who has raised his family well gets my full respect way higher than before. 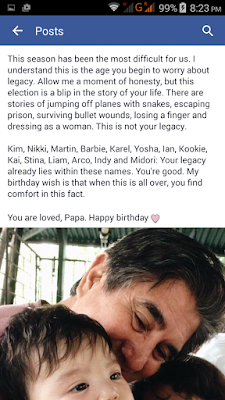 So now, when his family name Honasan is mentioned, the military uniform that goes through the back of my mind is now gone, I now picture him in a Barong, telling me stories like I am his daughter with those very enthusiastic eyes and a lot of positivity.Thank you Senator for this wonderful opportunity and looking forward to more kwentuhans. 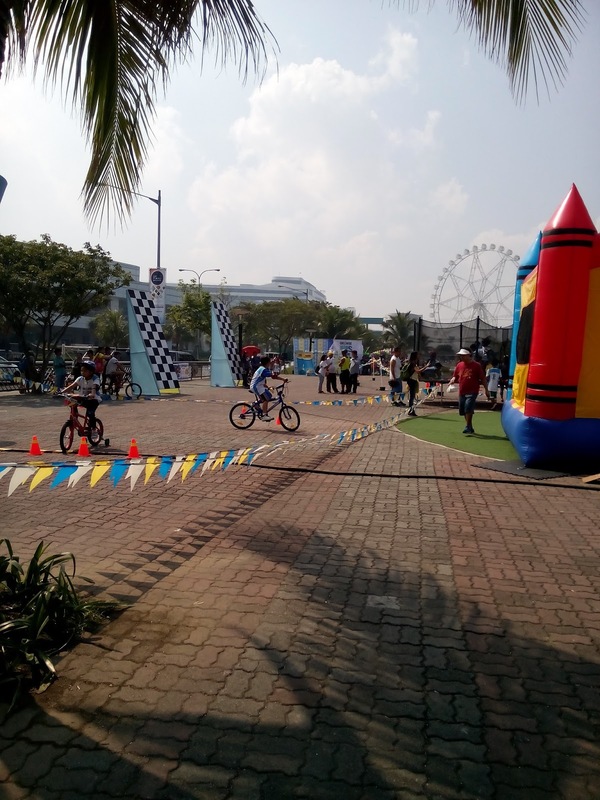 The Kids On Bike Event Kick Off courtesy of Growee happened at the SM Mall Of Asia Bay Area. Children as young as 3 up to 11 years old were geared up for the event. I am a first time mom with a 9 month old baby, so I decided to tag along my niece and nephew in which the PR organizer agreed to. I believe this event is very helpful in the bonding of families especially now that gadgets has replaced the actual playtime of kids to play and socialize with others. When we arrived we saw other kids on their bikes and off they go on the bike tracks, I was quite on panic thinking the event had already started, so we get in to the media registration got our race kit and was told that the resevation for the bikes was somewhere on the grounds. So we hurriedly went on and tried to look for the bikes, sadly there was no bikes available, we thought maybe other kids might be using them for their race and will be returned after, but the on going race was just for the 3 yr old category so we waited but bikes were all out. I don't know if there was lack of organization in terms of bike availment or there were no bikes at all. It was super hot, and the heat of the sun was beginning to set in on us, no bikes, and the kids started to lost their enthusiasm. The area was open to get the feel of biking on track, it was ok but I was expecting at least a tent where we could stay as we wait for the kids category; I was looking for a media tent actually, (there is usually a media tent or a standby area on outdoor events that I've attended) where in we could wait and leave the kids as we document the happenings on the ground and not to have them in tow and be directly under the sun, maybe a simple media tent would have made the experience a lot better and a few water bottles since the event was super early and the nearest refreshment booths were still closed. Honestly, I was very excited and has been looking forward for the Kids On Bikes event, but sadly I think improvements in organization could've made the experience more fun not just for the kids but for the parents and guardians as well. I believe this is the first and I know how hard it is to put together events as big as this one, but altogether I think it was a success seeing those kids and parents support their young ones in their biking journey. I just hope the next leg would be more organized in the sense that, no kids allowed on the track while there is another category that is being held because we got confused whose event is happening. Additional point persons on the ground since we kept hearing the host always looking for that one person who should do the listing of the race finishers, or they could use mini ribbons or medals for the cute kids who get to finish on top of their category to also avoid confusion. We wanted to stay, since we were prepared that the event was a whole day activity, but we couldn't stand the heat while waiting and again there were no bikes available some were even not available for use, either the tires were flat or there was something wrong with the pedals so we decided together with other mommy bloggers to call it a day since the kids were already complaining. Yes it took me awhile to write about this because I was contemplating into just writing this as is that everything was alright and it was a super perfect event, but thought maybe a few points would not hurt and may actually be of help for the next leg, I am just worried about the kids since the event was for them right? The Kids On Bikes event could be the best biking event for kids and I believe it can be still be improved for the rest of the leg. When it comes to education, it is nowadays essential to familiarize with the concept of systems thinking. Systems thinking involves concepts surrounding strategic thinking, critical thinking, solutions thinking, future and forward thinking, long-term thinking, and high level thinking. It is not analytic thinking, which is tactical, mechanistic, reductionist, and either/or thinking, one-best-method. This is when we engage in the concept of systems thinking when it comes to education. Systems Thinking focuses on relationships, multiple outcomes, holism and boundaries, the environment, the larger system, and feedback. Strategic Thinking is about clarity and simplicity, meaning and purpose, focus and direction, relationships and feedback, and desired outcomes. They are the same thought process. Despite being referred to differently, depending on the context, Systems Thinking and Strategic Thinking are fundamentally the same concept, only applied in different circumstances. It is a heuristics-based mindset, exactly what’s needed more of in today’s business environment. As above mentioned by author Chris Hoeller, he further elaborates on systems thinking through the use of Senge’s 11 Laws of Systems Thinking. Because today’s problems come from yesterday’s solutions. Leaders are happy to solve problems, but don’t always think about intended and unintended consequences. Too often, our solutions strike back to create new problems. Which makes a proper choice of institution one that breeds tomorrow’s leaders. Humans have a stubborn tendency to bully our way through tough situations when things are not working out as we would hope. We charge ahead without taking time to think through solutions to find better alternatives. Sometimes we solve problems; more often, especially in the current environment, we find ourselves up to our ears in more problems. This explains why it is essential to select the best institution that incorporates systems thinking. Primarily because behavior grows better before it grows worse as it is carefully molded as children grow older. Short-term solutions give temporary improvement at best but never eliminate fundamental issues and problems. These underlying problems will make the situation worse in the long run. Leaders often have a few quick fixes in their “quiver” of solutions that have brought quick and easy success in the past. Too often, the easy way out is retrofitting these fixes to any situation without regard to the unique contexts, people and timing. This often times occurs when the easy and familiar solution is not only ineffective but addictive and dangerous. It might even induce dependency. As Chris Hoeller continues to state, he says that faster becomes slower. At the first taste of success, it is tempting to advance at full speed without caution. Remember that the optimal rate of growth or change is far slower than the fastest growth or change that is possible. At the onset, Systems Thinking is probably the most complicated term you could possibly hear when you decide to enroll your child in a school or in a learning institution; however, it is a transformational experience that allows your child to reach his fullest potential in an environment that is in constant growth and fluctuation. Simply, systems thinking is the best experience you can give your child through education at the Benedictine International School (BIS). 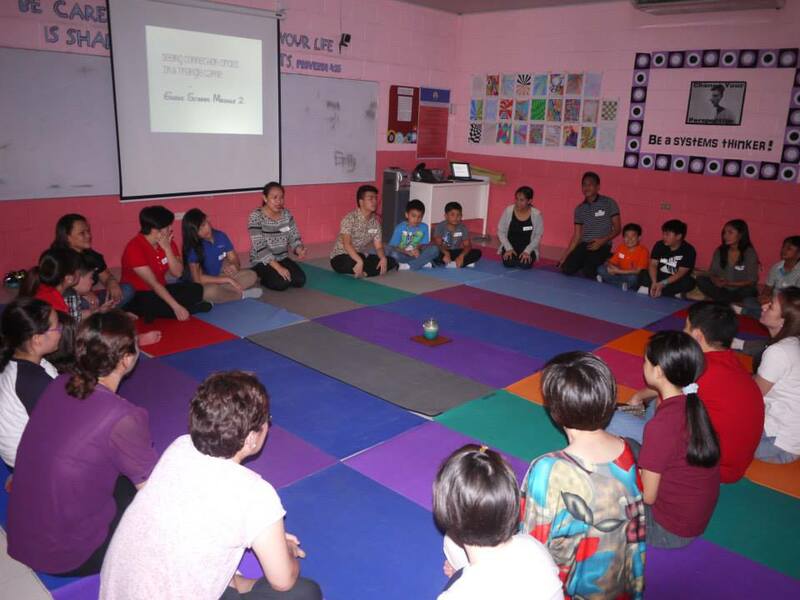 At BIS, systems thinking is incorporated into the child’s educational experience and the parents’ experience of their child’s development as leaders of the future. Seriously get involved in your child’s education by knowing new approaches like the Systems Thinking. Call Benedictine International School at +632.951.8960 / 951.7154 / 951.7454 and learn more about how you can help your child be successful in all avenues of life. 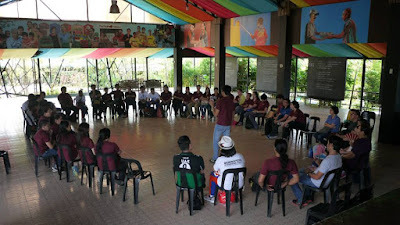 You may also visit the school website at www.benedictine.edu.ph or its Facebook page at www.facebook.com/BISphilippines. 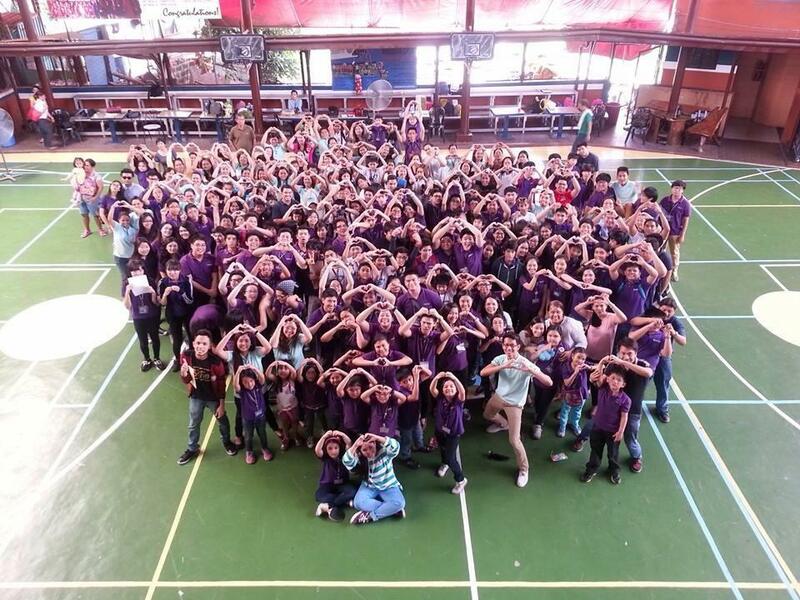 Benedictine International School is located at Capitol Hills Drive, Diliman, Quezon City. 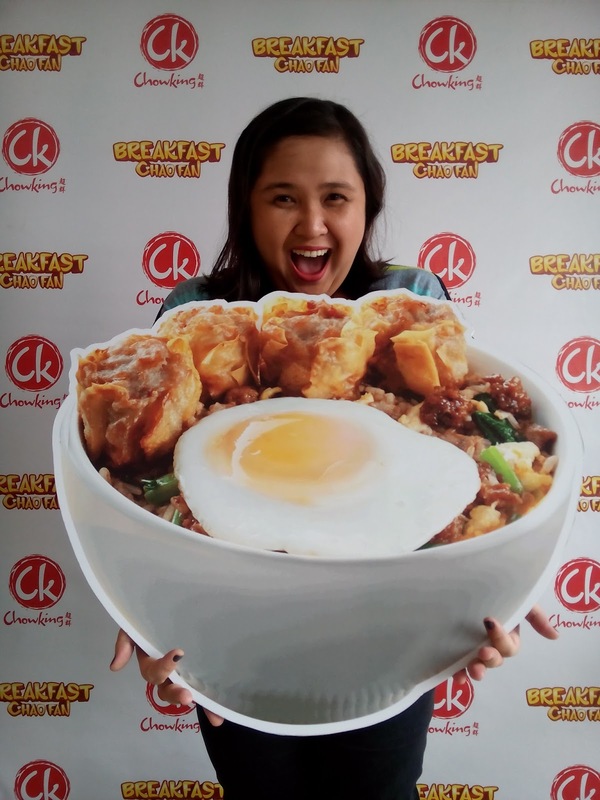 Chowking presents their newest breakfast feast and my personal favorite, the Chowking Breakfast Chao Fan! Our favorite regular Chao Fan now comes with 4 pcs fried siomai and egg that will be so perfect for a packed breakfast for an energy filled day. 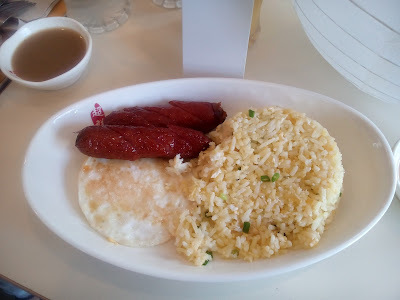 Aside from this they also have the Chinese Style Longganisa with Egg and Fried Rice that is super yummy too (now craving lol!). 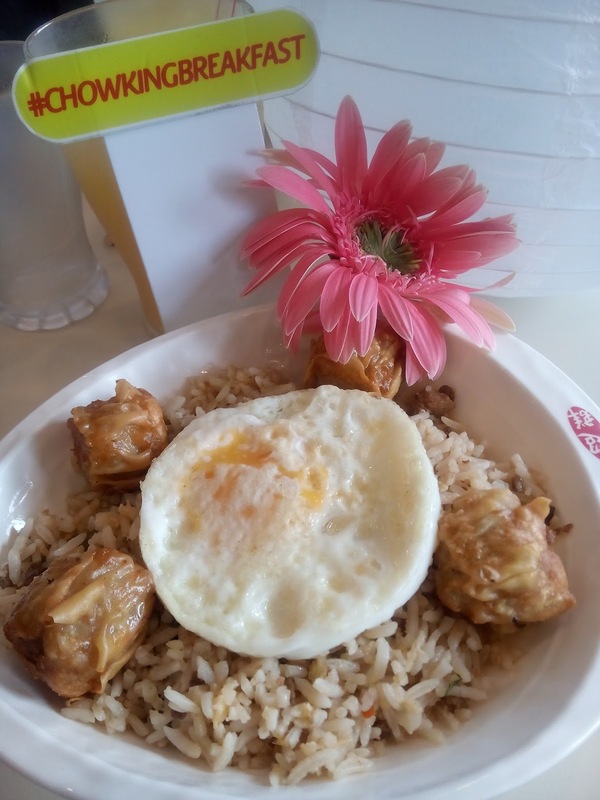 What's great about the Breakfast Chao Fan is that it is very affordable for only Php99 and the serving is huge and can really fill up your tummy to start your day right. 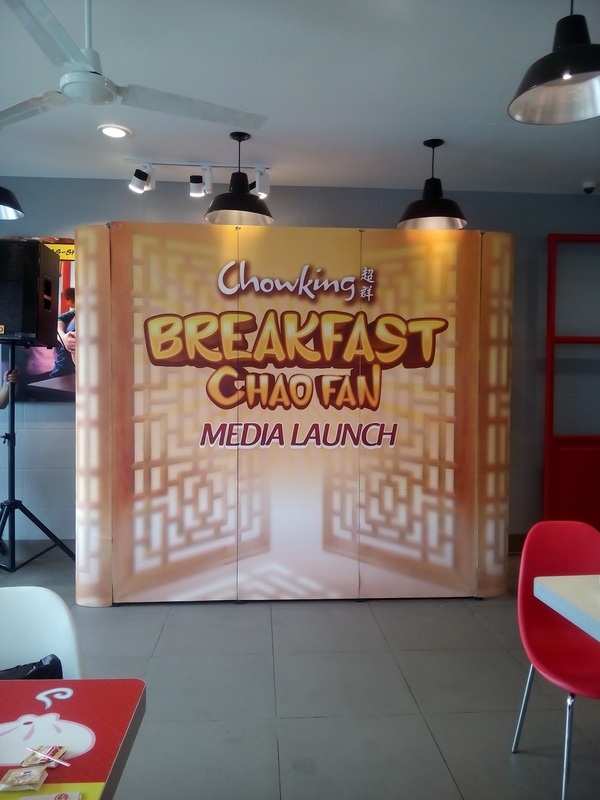 The Chowking Breakfast treats are availabe daily from 6am to 10am or if you are lucky could be up to 11am in some stores. So to have an amazing morning, drop by any Chowking stores for your breakfast fix and have a Wow Morning everyday. Chowking Presents the Breakfast Chao Fan! Book and Borders opened its second branch now at Bldg 5, Tuscany, Mckinley Hill, BGC. 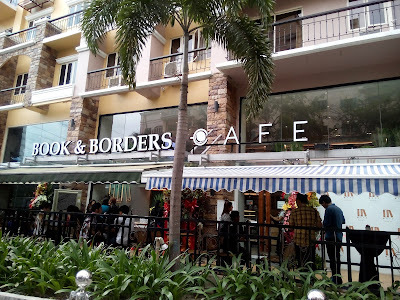 I was also invited when their first branch opened in Tomas Morato, by the looks and the homey feel I knew from the start that Book and Borders will open more branches in the metro. Ant true enough, BGC is very lucky to have B and B in their area, a space for you when you want to dine and eat, sip on your favorite drink and read a lot of books available on their shelves or bring yours to finish. Their interiors and set up makes me wish I had a space at home just like theirs. So when you feel the need to just relax and clear your mind, Book and Borders in Mckinley can be your sanctuary. Visit them soon ayt! In a city packed with bars and clubs, Book & Borders offers bookworms and individuals with quieter passions their own relaxing respite. But even if you come empty handed, don’t fret. Book & Borders offers an extensive selection of books, from the classics to contemporary bestsellers. And you are free to enjoy them at your leisure. The library is free and open for all, and for a better reading experience, customers are invited to use the book stands available at the café. 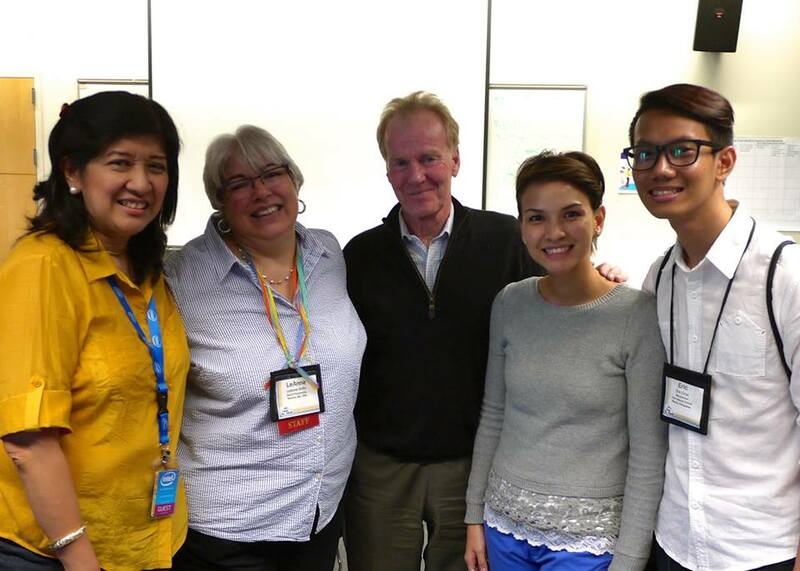 “I’m so ecstatic that there’s finally a place for people like us. It’s cozy and inviting, and you won’t get too distracted like in crowded cafes. 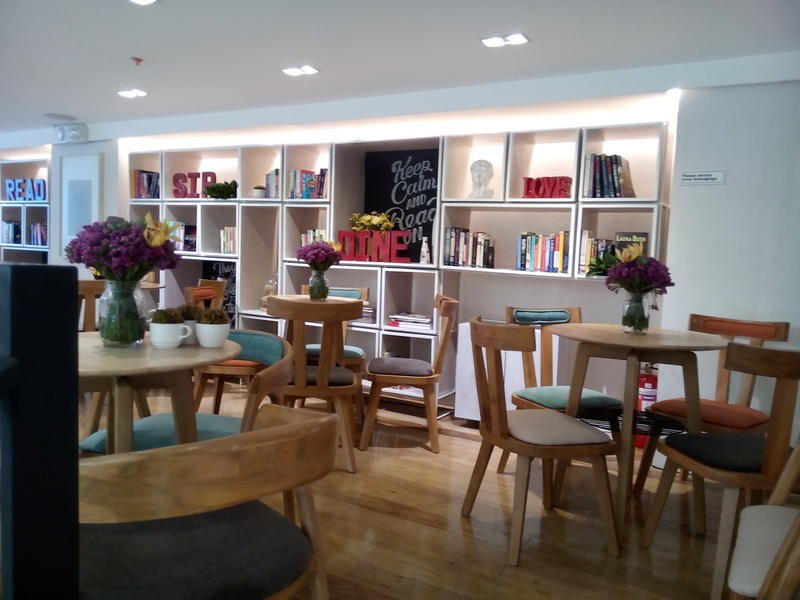 ‘Books + coffee’ spells the perfect afternoon,” shares Kapuso artist and budding poet Benjamin Alves. “What I love about Book & Borders is that there’s always something new to discover because they constantly update their library. 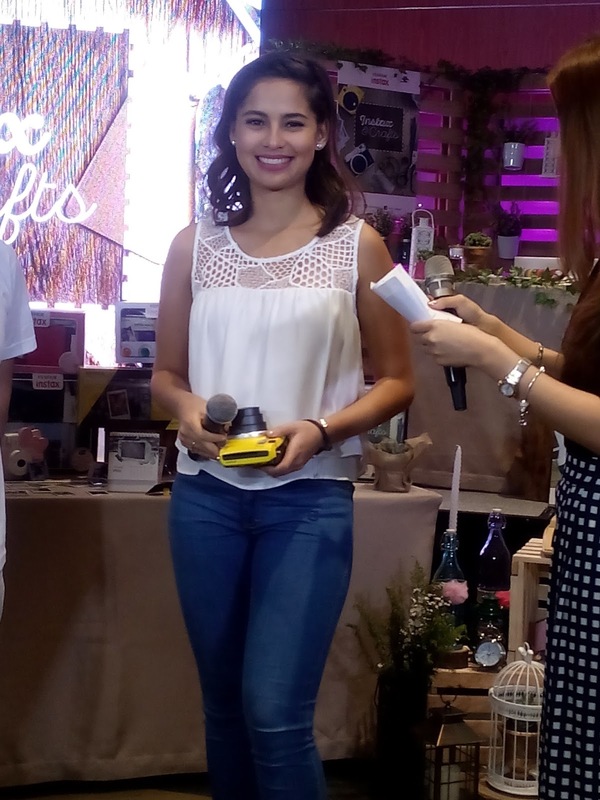 So even if you just want to browse, all the recent best sellers are on the shelves,” shares Karylle, a self-proclaimed bookworm and travel books collector. But the bestsellers are not only limited to the books on the shelves, you can find them on the menu as well. I am not a crafts person period. A big salute for those who can actually pull off everything in one paper, stickers, washi tapes letterings, threads etc. And still the look so cute and so neat and so artsy. I appreciate scrapbooking crafts and maybe I could envision how I wanted them to look like but doing them from scratch is a different story. And then Fujifilm came into my life, I attended their Instax and Crafts event, when we entered the area, it was crafts heaven, for someone like me who can't pull off anything artsy, I was in awe. 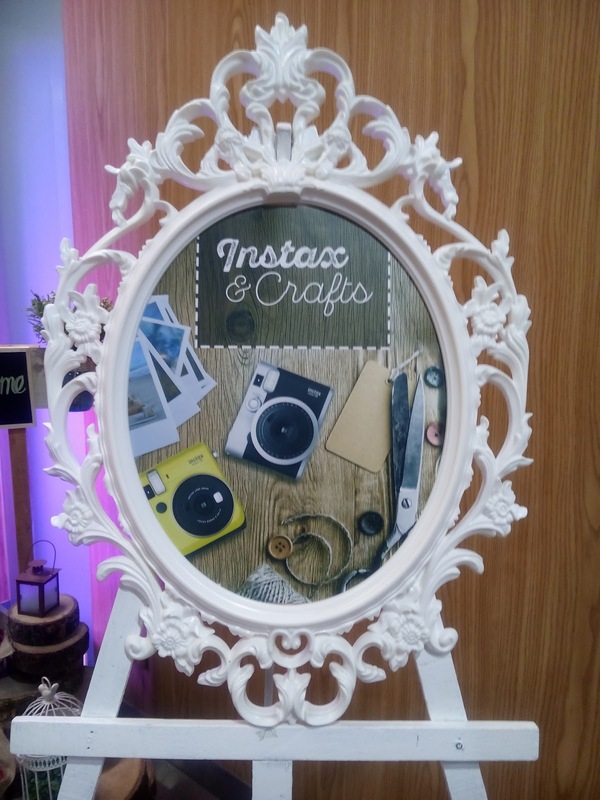 And then I was introduced to the Instax Share App which is downloadable from Apple Store and Google Play Store. It is an easy app wherein you can choose photos directly coming from your gallert, do a bit of editing and voila ready to print via the Fuji Instax Printer. It was my first time to actually have my photos printed and saw my self giggling the entire time a photo pops out of the printer. 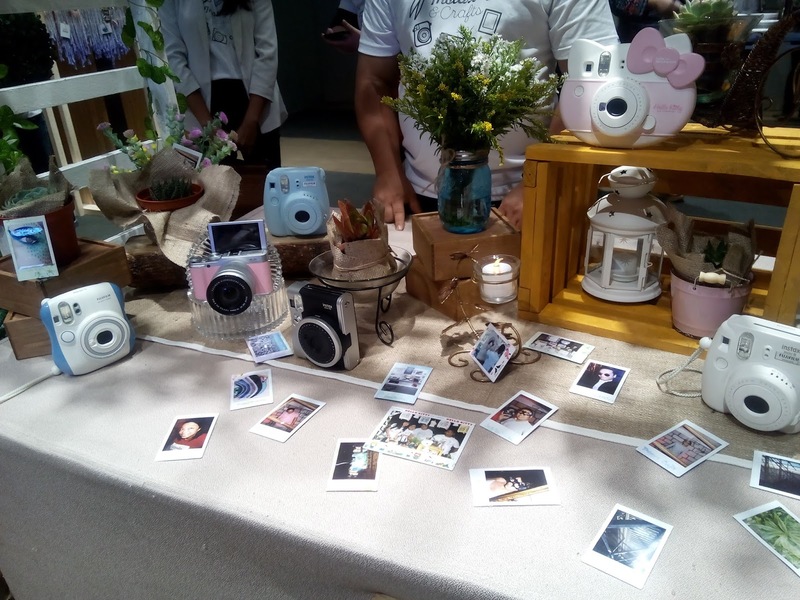 The main program started and we were told that we were to do some photo-scrapbooking-activity, everyone got excited because up for grabs were Fujifilm Instax Cameras and Printers. The activity was more exciting because Fujifilm long time crafter celebrity friend Jasmine Curtis Smith joined us and was so game to give us tips and suggestions about crafting. I super enjoyed the event, super relaxing, no pressure (except for the contest part lol!) And it was super duper fun, so sad I wasn't able to take home an Instax Cam or Printer but at least I learned and now has an idea on how to do a mini photo wall for the coming 1st birthday of my baby boy (will just borrow the printer from one of the winners lol! Can not afford the printer for now since we are preparing for his birthday) Indeed crafting can be a form of releasing so much stress. And yeah I didn't win (not artsy enough haha! ), but maybe I could try again next time, yes next time!